Tū mai. Panuku. Kōkiri. Stand Up. Next. Initiate. In our daily behind the scenes work we use agile methodology and te reo – but we can always do better. Reo Māori Writer Ranea Aperahama worked with the team driving agile throughout Te Papa to come up with reo interpretations of common terms (and some bonus ones for good measure). We’ve even made a poster for you to download for your workplace, and provided audio to help you hone your pronunciation. Here he runs through the interpretations with Senior Digital Editor Daniel Crichton-Rouse. Auckland Transport does it – even law firms are doing it. Making te reo Māori commonplace every day. At Te Papa, we have a solid starting point for te reo Māori by being the national museum. Biculturalism is built into the organisation’s Act, so we should of course use the language. But we also choose to. Our aim is to get to the point where it’s no longer a concerted effort because we are truly bilingual, not just bicultural. To visitors, it’s visible through our bilingual labels in the museum. Behind the scenes, staff have weekly lessons, sign off emails with ‘ngā mihi’, and reo is an integral part of our staff meetings through karakia and waiata. Now we’re striving to increase our usage in conversation. For some, this is about overcoming insecurities. “Are we walking our principles, the values of Te Papa?” asks Reo Māori Writer, Ranea Aperahama. While our fridges may be covered in reo phrases – kawhe anyone? – there are other places (particularly some covered in Post-it Notes) that require some attention. Namely our stand-up boards, our papa kōrero. So our latest reo-ing up is with agile. 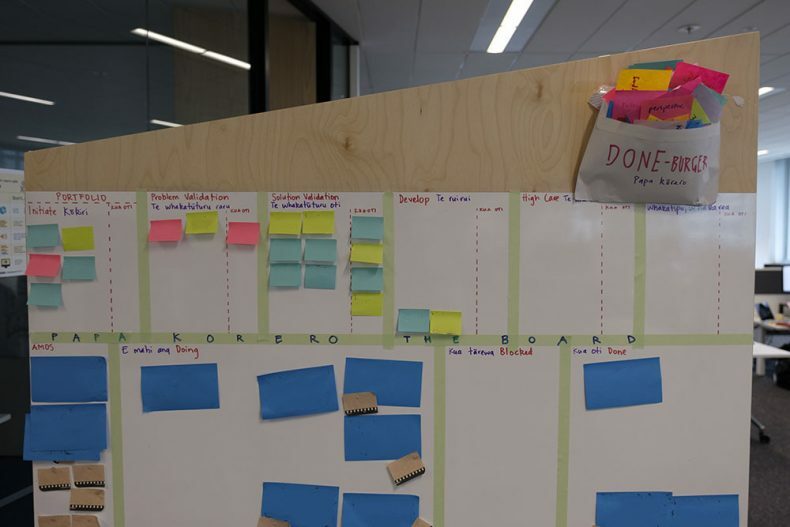 You may be familiar with agile methodology (here’s the manifesto), and many teams here at Te Papa have embraced practices such as scrum and kanban as ways of working. Everyday words such as ‘doing’, ‘blocked’, and ‘backlog’ take on very specific meanings in this context. Those of us working with agile were keen to see what the reo interpretations of these words would be – not as translations, but to look at the fundamentals of the words and discover their equivalent in Māori. Ranea enthusiastically came on board, and over a series of discussions about what something like ‘develop’ really means, and the nuances of language, he came up with the reo Māori. “It takes a while to sit there and soak it in and really understand what is being said,” he says. 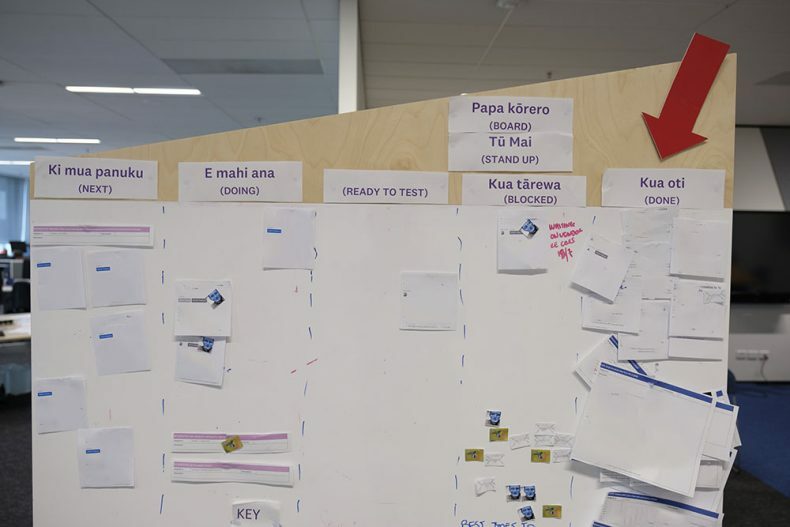 What follows is a list of terms used in agile practices, Ranea’s reo Māori interpretations of them, and the thinking behind these interpretations. You can also listen to Ranea’s pronunciations. Agile is to be nimble, quick to adapt, to shift or change quickly – qualities that are useful when you’re tacking on a boat. Therefore, the Māori term I’ve chosen borrows from how you would masterfully navigate, or row, a canoe. Whether the sea is flat or tumultuous and challenging, you have to be aware of your environment, and adjust how you paddle or sail. One simple word is kakama, which means ‘quick to adjust’, or ‘fast’. Another option is he ringa miti tai heke. Miti: To lick – your hand licks the water. Tai heke: Tidal waters – experience in handling the canoe in strong tidal waters. He ringa miti tai heke: You’re adjustable. Another way to express it is te ararau o Tangaroa. Ara means path, rau means many – ‘the many pathways of Tangaroa’. There are many ways you can travel the sea, but you have to be able to adjust to the elements, weather patterns, and other natural things that occur at sea. He kakama koe – you’re agile! Not Te Papa’s Board, but a board, or wall – a flat surface. But it can also refer to discussion, a place where you have a debate or dialogue. There are two ways to interpret papa. Papa is a flat surface, so it can be the wall, the surface you write on. Or papa can be the surface you stand on, the place where you stand. It’s like our name, Te Papa – the land, the place where we stand. So papa is where you write or present your thoughts. And kōrero means ‘dialogue’ or ‘discussion’. Papa kōrero gives us ‘the board’. In te reo Māori stand-up is tū mai. Tū means ‘stand’, mai means ‘in front’. When you say ‘e tū’ it’s a direct instruction. With ‘tū mai’ you have more freedom – you can choose to stand or not. Tū mai can also mean to be active, to show, exhibit, or express yourself. You know how you can get sort of clogged up? Pile, heap, collection, cache, corpus, archive, store, hoard, reserve, stockpile. I like the word ‘stockpile’ – a supply, or stash. In te reo Māori, it’s whakaputunga, the collection of something. It’s held, or grouped, somewhere – and not moving. ‘Next’ implies a forward motion, to go from one point to another. It can also mean ‘in front of’, or ‘ahead’. The phrase in te reo Māori is ki mua. Ki is ‘to’, and mua is ‘front’. Another word is panuku. Pa is ‘to cause an act’, and nuku is ‘move’. So, panuku is to move next, to go from one state to another. This is about doing something. An action in progress. Activity, exercise, operation, function. In te reo Māori, mahi is the word for ‘action’. The ana is the progress in action – or action in progress. So e mahi ana is doing. The ‘ana’ is like ‘–ing’ in English. The do-ana, the doing. Or, the mahi-ing! E mahi ana! There are different ways you can look at what ‘blocked’ means. You can have a blocked toilet. You could look at it that way. Or, something has not changed from one state to another – unresolved, unsettled, undecided, unfinished, inconclusive, delayed, deferred. The key word here in Māori is tārewa – to hold in suspension. Kua is past tense – it’s just happened. Kua tārewa – it’s suspended, on hold. Done. Finished. Finito. Something has changed from a state of doing, to a state of being complete. Kua is past tense, and oti is ‘finish’. So, Kua oti, done. To put it in a sentence that could be useful around Te Papa: Kua oti te mahi – the task is done. Tū is the type of activity, and mahi is activity. Exercise. Operation. Function. So, it’s the type of task or activity. Tū mahi gives us ‘chore’. We all know what ‘risk’ means in relation to problems, trouble, or conflict. The key word here is raru. Raru is the word for trouble or conflict. Tū is a state, what type of problem it is. Tū raru gives us ‘risk’. There are many ways to describe ‘initiate’ – start, thrust forward, attack, rush forward, champion, lead, advocate. The spirit of these words can be brought into the Māori word kōkiri. Kō is a direction, and kiri is the force that you give to that direction. So, initiate is to push something, to move it somewhere – which gives us kōkiri. With te reo Māori, context is everything. There are many ways you can translate ‘develop’. What I’ve chosen is based on discussions from meetings around the word ‘develop’. Ruirui means to sprinkle, to shake to and fro with the hand upright, like when you’re sprinkling seeds. It’s the beginning stages of growing, or developing, something. When we say ‘high’ in relation to care in this context, we mean mean deliberate, purposeful, intentional. So ‘high care’ in te reo Māori is te āta. Morimori is when you hold something in your hands and you’re very careful with it. You caress it, handle it carefully, nurture it. So, te āta morimori is ‘high care’. This is related to our discussion about ‘develop’ – te ruirui, to sprinkle seeds. After you’ve cast the seeds and watered them, the warmth and nutrients in the soil help the seeds to grow. Whaka means cause it to, and tipu means to grow. Tipu can also refer to the plant itself. So, whakatipu means to cause to grow. To sustain something, you multiply it and strengthen its growth. ‘Multiply’ in Māori is whaka, and rea means to grow, grow, grow. Whakarea is really saying to cause to grow, grow, grow! So, to grow and sustain is whakatipu, whakarea. This is about spur of the moment thinking, multiple choices, multiple ideas. To express that in Māori is ohia, a way of spontaneous thinking, and mano, the word for thousand. So, many thousands of thoughts gives us ohia mano. Do you use te reo in your workflow? If so, let us know! The booklet was made to hand out at the 2018 National Digital Forum. It includes new kupu (words) not listed above. Then fold, staple, and put in your pocket. Hey Folks, Auckland Council use it. We have a goal to include Te Reo names in all our topic page subheadings. Great poster. Now have it next to our papa korero. Great to hear you’re using the poster! We’re working on an even larger set of words, so expect an update in the not too distant future. Great article, will use this next week for Maori Language Week. Ka pai, Steve. Hope it was useful.